This recipe from Coquille in Vancouver, B.C., is a bit of a project, but its tropical glory — and heavenly white-chocolate chantilly fluff of a topping — makes it a standout. DESSERT DOESN’T really feel optional at lovely Coquille in Vancouver, B.C. — not after watching slice after slice of something beautifully crowned with a fluffy cloud ferried to every table around. The server said it was banana cream pie, which has never been my first (or even second) choice, but it looked incredible. What kind of fool would deny such a pie? As I later learned, attempts to take it off the menu have failed in the face of patrons’ protests. And indeed, it turned out to be extraordinarily good: rich but light, perfectly banana-y, a tropical luxury that’s now been on my mind since summertime. Coquille’s executive pastry chef, Hilary Prince — also in charge of the desserts at renowned Vancouver sister restaurant, L’Abbatoir — rethought every element of the classic banana cream construction. 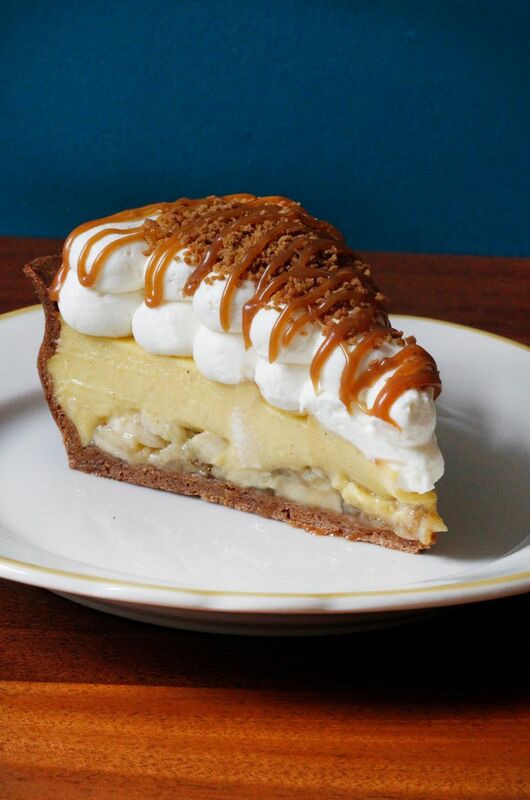 Her goal: “Just to make the best banana cream pie that I could imagine,” she says. “I had no idea that it would become as popular as it has, and now it seems I’m stuck with it!” It’s made with slices of fresh banana and a homemade caramelized banana jam, plus a layer of vanilla pastry cream, and the topping’s got white chocolate incorporated into its fluffy heaven. Furthermore, the caramel sauce contains an ingredient so good, it’s illegal in the United States: tonka beans, beloved by haute chefs, deadly in high concentrations. Reminded that we can’t get it here (except, psssst, maybe online), Prince said, “Poor you guys!” and kindly offered a substitution: the seeds of one vanilla bean. Alternately, she’s also been making an orange-clove caramel “for a little seasonal change,” perfect for a holiday pie — same recipe, but infused with whole cloves instead of the tonka (or vanilla) bean. While Prince has simplified the process for the home cook — she makes her own graham crackers for the crust — this is still quite a pie project. She agreed that one could make regular chantilly cream instead of white chocolate, or buy some nice caramel sauce instead of dealing with homemade. Even then, this pie would be a standout among pies, promising to remain in the memories of those lucky enough to get some. 1. Melt white chocolate in a double boiler. 2. Bring first measure of cream to a boil with invert sugar and glucose. Pour over white chocolate, and stir gently to form smooth emulsion. 3. Stir in the second measure of cream, and refrigerate. 1. Blitz graham crumbs with flour in food processor to combine. Add butter, powdered sugar and salt, and blitz until butter is a fine crumb. Transfer to a bowl or mixer. 2. Combine egg yolks and cold water, and add to dry ingredients. Mix until dough comes together. Wrap, and press into a disk. Rest in fridge until completely cooled before rolling. 3. Roll out tart dough, and line a 10-inch tart shell (ideal is 2 inches deep). Rest in freezer before blind baking. 4. Blind bake tart shell from frozen with blind baking beans for about 40 minutes at 325 degrees, then remove the beans and bake an additional 5-10 minutes, until the bottom is fully cooked. Cool completely. Trim edges if necessary. 1. Combine sugar and water, and bring to a light amber caramel. 2. Add sliced bananas, and cook, stirring often, until bananas break down and become translucent, and jam is thick with very little liquid left (about 15-20 minutes). 3. Remove from heat, and stir in salt, lime juice and vanilla bean seeds. 1. Set 100g caramelized banana jam in an even layer in the bottom of the prepared tart shell, then lay 300g sliced ripe bananas evenly over banana jam. Press down slightly to eliminate gaps. Hold in fridge until pastry cream is ready to set over top. 1. Heat milk with vanilla bean seeds and salt, and bring to a simmer. When ready, remove from heat and set aside. 2. Bloom gelatin leaf in very cold water. 3. Whisk egg yolks with sugar, then add flour and whisk until smooth. Temper with hot milk mixture. 4. Return to low heat, and bring to a boil, stirring constantly and thoroughly so eggs don’t curdle or stick. Boil about 2 minutes, until pastry cream is thick. 5. Remove from heat, squeeze excess water from gelatin leaves and stir into hot pastry cream. 6. Pass through a fine chinois, then set into tart shell over the bananas. 7. Refrigerate to set, and cool completely. 1. Combine cream, orange zest and tonka bean; heat to infuse. 3. Lower heat, and cook to allow any seized sugar to melt back in. 4. Remove from heat, and stir in butter and salt. Strain through fine chinois. Cool. Set pastry cream in an even layer over banana layer. Garnish tart with white chocolate chantilly whipped to firm peaks, tonka bean caramel and crumbled graham crackers.